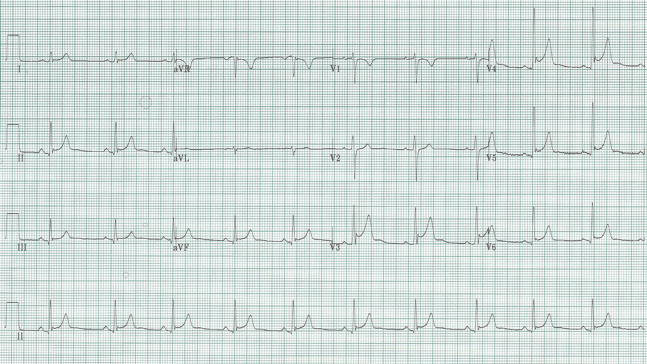 50-year-old woman, a chronic alcoholic, with three days of nausea, vomiting and diarrhea, presents after syncope. The important features to recognize in this EKG is the appearance of a U wave and the diminution of the T-waves, leaving the appearance of a prolonged QT in several leads. The differential of a prolonged QT interval, besides offending medications, are hypokalemia (seen with increasing U waves and diminishing T waves), hypomagnesemia, and hypocalcemia. Alcoholics are already prone to hypomagnesemia, and the addition of several days of gastroenteritis may quickly deplete other electrolytes and cations. Remember that alcoholics who become sick are at risk for prolonged QT, torsade de pointe, and syncope or sudden death! 60-year-old man presents with right-sided hemiparesis and aphasia. 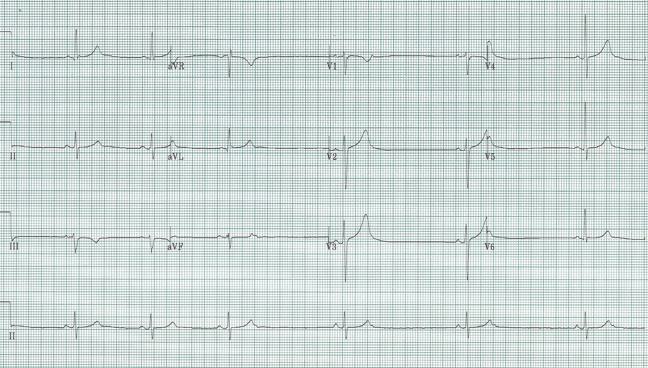 What do you make of these EKG changes? T-wave inversion in the anterior leads has a broad differential. Deep, or giant, T-wave inversion has it’s own differential including CNS changes (see full differential under Impressive T-wave Inversion on TorreyEKG.com). 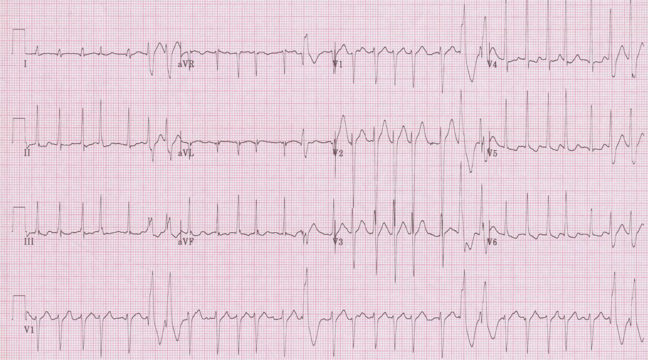 More minor T-wave inversion can be seen with ischemia, acute PE, evolving or subacute STEMI, and many other causes. These T-wave inversions in leads with well-formed Q waves suggest a subacute MI, possibly days to weeks old (the Q’s have formed, the ST-segments are back close to baseline, but the T-wave inversion can persist for weeks). And what is the connection between a recent anterior MI and his presentation with a stroke? Once anticoagulated on heparin, a transesophageal ultrasound showed a large mural thrombus in a dyskinetic wall of his left ventricle. 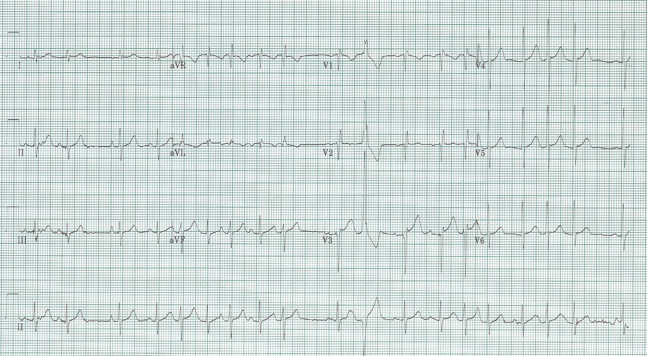 28-year-old obese man presents after syncope and with this EKG. He is hypotensive at 78/46. Thoughts and plans? His level of hypotension seemed unusual for an acute septal MI, especially in an otherwise fairly healthy young man. He had no chest pain, just some shortness of breath. RUSH (Rapid US in Shock) exam revealed a massively dilated right ventricle. When asked about leg pain, he described significant pain in his right calf for 2 days. Ultrasound of the right popliteal area revealed a non-compressible vein with intramural clot. 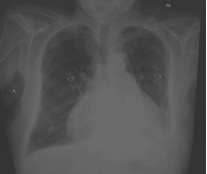 STAT CT angiogram revealed large bilateral pulmonary emboli. 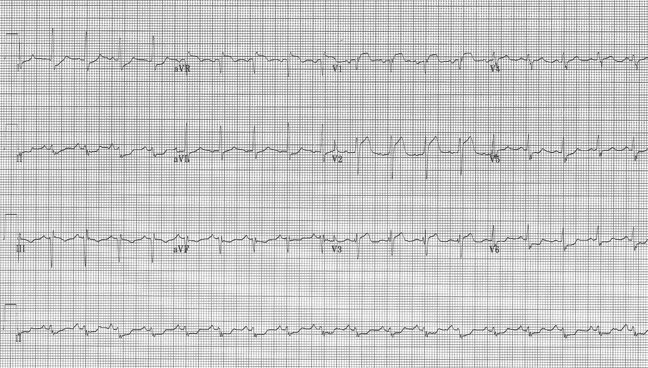 This patient received TPA in the ED and has done well. 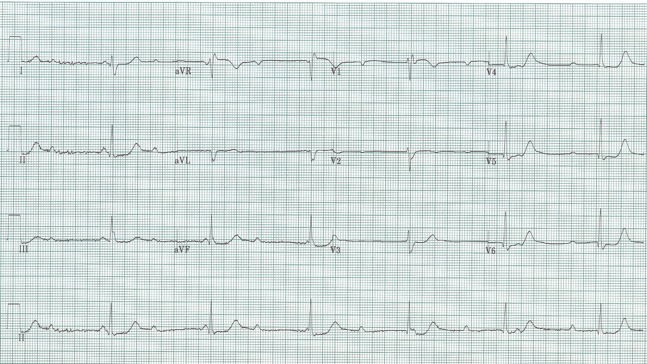 While PE has no definite EKG findings, it is a great masquerader…it can present with T-wave inversion anteriorly (small or giant T-wave inversion) and with ST-segment elevation on occasion. 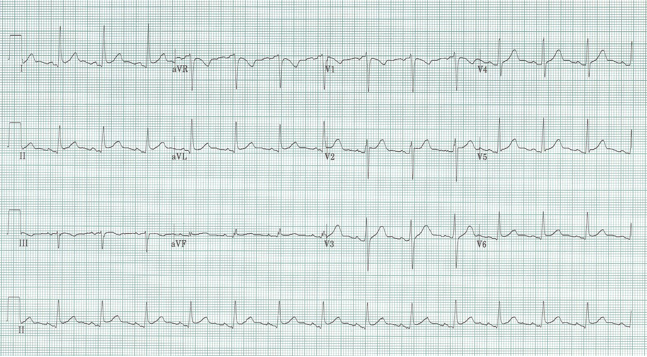 Keep PE on many differentials, especially when the EKG findings don’t quite fit with the clinical presentation. 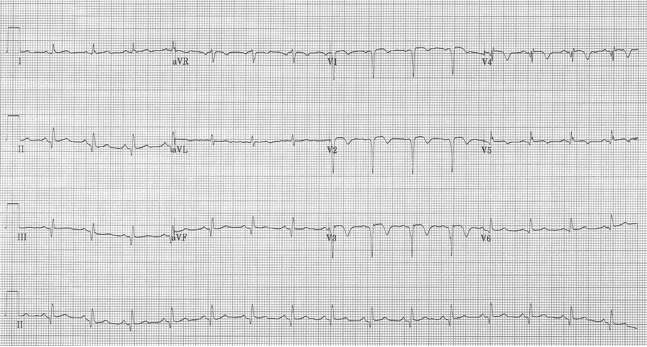 28-year-old man with chest pain x 2 hours. 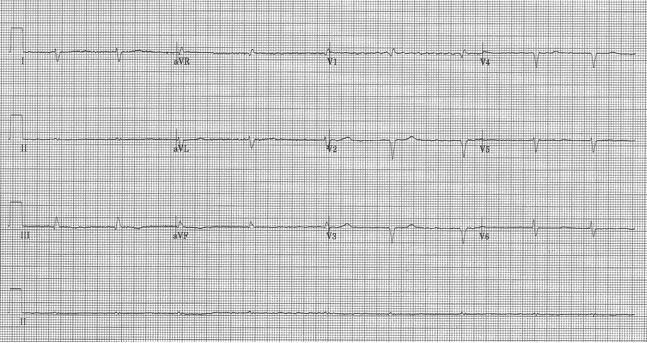 This EKG is common in the ED and worth being comfortable with so that young healthy patients are not inadvertently thrombolysed or referred to interventional cardiology. While there is noticeable ST-segment elevation in lead V3-5 this pattern is consistent with Benign Early Repolarization. 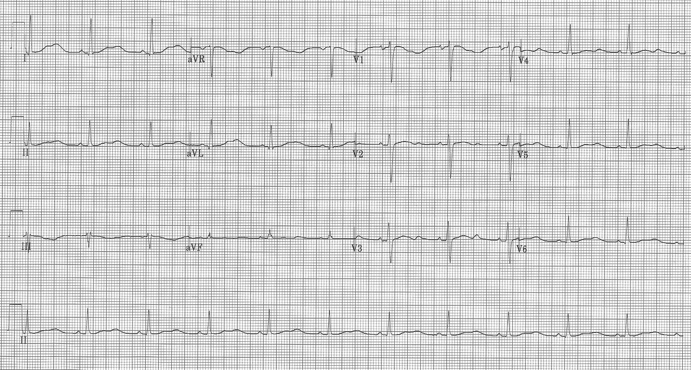 Notice that the ST-segment elevation occurs in association with large amplitude QRS complexes in the chest leads, and often has a notched, or “fishhook”, appearance at the J point (apparent here in V4-5). Another corroborating find in early repolarization is an early R/S transition. Usually, the R/S ratio progresses across the chest leads (V1 – V6) with the transition, or R/S closest to 1, occurring in V3-4. In early repolarization the R/S transition often occurs before V3 as in this example. Finally notice that there are no reciprocal changes noted in other leads as would typically be present with ST-segment elevation associated with an acute MI. Each of these findings, particularly in young healthy men with an appropriately atypical chest pain complaint, suggests benign early repolarization.